Who knew that an unlikely friendship and a few games of cricket with one of the greatest mathematicians in the early 20th Century could lead to a breakthrough in population genetics? Today, it is almost commonplace for us in the scientific community to accept the influence natural selection and Mendelian genetics have on one another, however for the majority of human history this was not the case. Up until the early 1900s, many scientists believed that these concepts were nothing more than two opposing and unassociated positions on heredity. Scientists were torn between a theory of inheritance (a.k.a. Mendelian genetics) and a theory of evolution through natural selection. Although natural selection could account for variation, which inheritance could not, it offered no real explanation on how traits were passed on to the next generation. For the most part, scientists could not see how well Mendel’s theory of inheritance worked with Darwin’s theory of evolution because they did not have a way to quantify the relationship. It was not until the introduction of the theorem of genetic equilibrium that biologists acquired the necessary mathematical rigor to show how inheritance and natural selection interacted. One of the men who helped provide this framework was G.H. Hardy. G. H. Hardy. Image: public domain, via Wikimedia Commons. Godfrey Harold (G.H.) Hardy was a renowned English mathematician who lived between 1877-1947 and is best known for his accomplishments in number theory and for his work with the another great mathematician, Srinivasa Ramanujan. For a man who was such an outspoken supporter of pure mathematics and abhorred any practical application of his work, it is ironic that he should have such a powerful influence on a field of applied mathematics and help shape our very understanding of population genetics. How did a pure mathematician come to work on population genetics? Well it all started with a few games of cricket. Whilst teaching at the University of Cambridge, Hardy would often interact with professors in other departments through friendly games of cricket and evening common meals . It was through these interactions that Hardy came to know Reginald Punnett, cofounder of the genetics department at Cambridge and developer of Punnett Squares, which are named for him, and developed a close friendship with him. Punnett, being one of the foremost experts in population genetics, was in the thick of the debate over inheritance vs. evolution. His interactions with contemporaries like G. Udny Yule, made him wonder why a population’s genotype, or the genes found in each person, did not eventually contain only variations, known as alleles, of a particular gene that are dominant. This was the question he posed to Hardy in 1908, and Hardy’s response was nigh on brilliant. The answer was so simple that it almost seemed obvious. Hardy even expressed that “I should have expected the very simple point which I wish to make to have been familiar to biologists’’ . His solution was so simple in fact that unbeknownst to him, another scientist had reached the same conclusion around the same time in Germany . In time, this concept would be known as Hardy-Weinberg Equilibrium (HWE). In short, HWE asserts that when a population is not experiencing any genetic changes that would cause it to evolve, such as genetic drift, gene flow, selective mating, etc., then the allele (af) and genotypic frequencies (gf) will remain constant within a given population (P’). To calculate the gf for humans, a diploid species that receives two complete sets of chromosomes from their parents, we simply look at the proportion of genotypes in P’. To calculate the af, we look at the case where either the gene variation is homozygous and contains two copies of the alleles (dominant—AA || recessive—aa) or heterozygous and only has one copy of each allele (Aa). P’ achieves “equilibrium” when these frequencies do not change. In order to fully account for the population, the gf and af must sum to 1. And, since each subsequent generation will have the same number of genes, the frequencies remain constant and follows either a binomial or multinomial distribution. One important thing to keep in mind, however, is that almost every population is experiencing some form of evolutionary change. So, while HWE shows that the frequencies don’t change or disappear, it is best used as a baseline model to test for changes or equilibrium. Using this formula, researchers can create a baseline model of P’ and then identify evolutionary pressures by comparing any subsequent frequencies of alleles and genotypes (F∝) to F. The data can then be visually represented as a change of allele frequency with respect to time. HWE represents the curious situation that populations experience when their allele frequencies change. This situation is realized by first assuming complete dominance, then calculating the frequency of alleles, and then using the resultant number as a baseline with which to compare any subsequent values. Although there are some limitations on how we can use HWE—namely, identifying complete dominance, the model is very useful in identifying any evolutionary pressures a population may be experiencing and is one of the most important principles in population genetics. Developed, in part, by G.H. Hardy, it connected two key theories: the theory of inheritance and the theory of evolution. Although, mathematically speaking, his observation/discovery was almost trivial, Hardy provided the mathematical rigor the field sorely needed in order to see that the genotypes didn’t completely disappear and, in turn, forever changed the way we view the fields of biology and genetics. Edwards, A. W. F. “GH Hardy (1908) and Hardy–Weinberg Equilibrium.”Genetics3 (2008): 1143-1150. Edwards, Anthony WF. Foundations of mathematical genetics. Cambridge University Press, 2000. Guo, Sun Wei, and Elizabeth A. Thompson. “Performing the exact test of Hardy-Weinberg proportion for multiple alleles.” Biometrics(1992): 361-372. Hardy, Godfrey H. “Mendelian proportions in a mixed population.” Science706 (1908): 49-50. Hardy, G. H., & Snow, C. P. (1967). A mathematician’s apology. Reprinted, with a foreword by CP Snow. Cambridge University Press. Pearson, Karl. “Mathematical contributions to the theory of evolution. XI. On the influence of natural selection on the variability and correlation of organs.”Philosophical Transactions of the Royal Society of London. Series A, Containing Papers of a Mathematical or Physical Character(1903): 1-66. Pearson, K., 1904. Mathematical contributions to the theory of evolution. XII. On a generalised theory of alternative inheritance, with special reference to Mendel’s laws. Philos. Trans. R. Soc. A 203 53–86. Punnett, R. C., 1911. Mendelism. Macmillan, London. Punnett, R. C., 1915. Mimicry in Butterflies. Cambridge University Press, Cambridge/London/New York. Punnett, R. C., 1917. Eliminating feeblemindedness. J. Hered. 8 464–465. Punnett, R. C., 1950. Early days of genetics. Heredity 4 1–10. Snow, C. P., 1967. G. H. Hardy. Macmillan, London. Sturtevant, A. H., 1965. A History of Genetics. Cold Spring Harbor Laboratory Press, Cold Spring Harbor, NY. Weinberg, Wilhelm. “Über vererbungsgesetze beim menschen.” Molecular and General Genetics MGG1 (1908): 440-460. Weinberg, W. “On the demonstration of heredity in man.” Boyer SH, trans (1963) Papers on human genetics. Prentice Hall, Englewood Cliffs, NJ(1908). Is Math an Invention or a Discovery? A few months ago I was sitting at home watching one of those shows about the universe, you know where they try to condense everything there is to know about our world into a few short episodes? This particular episode was about Isaac Newton and all of his work. In this episode they were discussing how he invented Calculus and how he forever changed the way that we understand our universe. At this point I was pretty intrigued when my boyfriend raised a question I never really gave much thought to. He said to me “Do you believe math is something we discovered or something we invented?” My immediate reaction was that math was a discovery; there is no way that we just made all of this up! After this conversation occurred I started to notice that this was a question I began to think about often, but I never really could come up with a solid answer. So I will raise the same question again, was Math invented or discovered? Let’s start with the discovery side of things; there are many different mathematicians who believe that math was a discovery, such as Plato and Euclid. Mathematical Platonism is “the metaphysical view that there are abstract mathematical objects whose existence is independent of us and our language, thought, and practices.” This philosophical viewpoint is stating that our universe is made up entirely of math. When we begin to understand math we are allowing ourselves to understand more about how the world around us works . Have you ever thought about how math occurs in nature, that there are patterns and sequences all around us? Euclid believed that nature was a physical manifestation of math . Examples of mathematics in nature include honeycombs, wings of insects, shells, and flowers. We also find the opposite of patterns in nature, uniqueness. The theory that no two snowflakes are the same is an example of uniqueness occurring in nature. Another more modern theory that supports the notion that math is a discovery is the mathematical universe hypothesis, which was proposed by a cosmologist Max Tegmark. This theory states, “Our external physical reality is a mathematical structure.” Basically he is saying that math is not necessarily used to describe our universe, but rather our universe is one mathematical object. I think this theory is very intriguing and would make perfect sense. It would explain why math can be applied to everything that we know. On the other side we have the belief that math is an invention. The most common theory is that math is a completely human construct, which we made up in order to help us have a better understanding of the world around us. This theory is called the intuitionist theory. The theory is a rejection to Mathematical Platonism and states that “The truth of a mathematical statement is a subjective claim: a mathematical statement corresponds to a mental construction, and a mathematician can assert the truth of a statement only by verifying the validity of that construction by intuition.” Opposing the mathematical universe hypothesis is Gödel’s first incompleteness theorem. His theorem states that any theory that it has axioms can’t be consistent and complete at the same time. This theory would show that math itself is like one giant loop. Every time we solve one problem based on assumptions we gain another problem that we must now base on assumptions we made from the last problem. This cycle will continue to repeat itself over and over and is inexhaustible. Another common observation about math is how we actually carry out the process. If math were a discovery would we always have the same method for each problem. As shown in class the Egyptians had a completely different way to multiply that can be more effective than our current system of multiplication because it involves less memorization. Are our different methods for the same math problem enough to show that math is an invention? Or is it enough that we can get to the same solution, so the process isn’t as important? There is even the possibility that there are more discoveries to be made which could end our need for different methods to get to the same solution. There could be a missing link in our chain that we have to work around in order to get the solutions we need, but if we found that missing link we would only need one method to solve our mathematical problems. This entry was posted in Math and Nature and tagged discovery, intuitionism, invention, math, Mathematics on February 17, 2015 by u0752301. 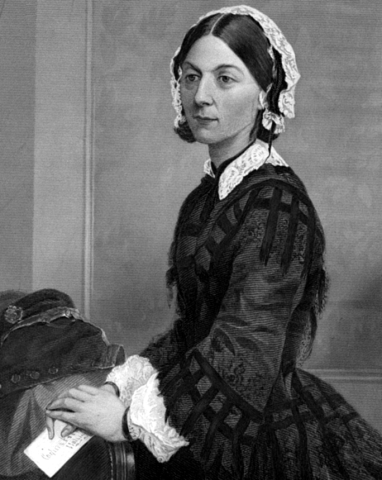 Almost everyone has heard of Florence Nightingale: the Nurse; very few people have heard about Florence Nightingale: the Statistician. Ironically, however, she is one of the most important statisticians to have ever graced the field. Yes, her improvements to sanitation were revolutionary, and surely saved countless lives, but how she was able to bring about those improvements was equally innovative. Picture this: It’s 1855 during the Crimean War. The air is rank and humid, filled with the smell of blood and sulfur—the fresh, salty aroma of the adjacent Black Sea long forgotten. Although you are required to help care for the many wounded soldiers, you are also charged with collecting, accurately keeping, and even analyzing army mortality records. Florence Nightingale (FN) believed that allowing 16,000 men to die from causes that were easily prevented with improved sanitation was almost akin to murder, and it would be equally criminal to do nothing to prevent these needless deaths from happening again. She also felt it was downright disgraceful, if not scandalous, for a nation that considered itself the epitome of civilization to be this neglectful of their sanitation policy. Sadly, these poor sanitary conditions were not just associated with the battlefield. As the war ended and FN returned home, she found that army barracks and even the hospitals experienced equally appalling mortality rates from disease. She knew sanitation policies needed to be improved. She knew her statistical analysis was the best tool she could use to convince others of this need. Yet, she also knew that she would have to develop a better way to convey her data to the general public. She realized that although the empirical evidence would easily convince those who knew how to read the data, publishing it in the traditional way would severely limit the amount of people who could actually utilize the information. A smaller group of supporters meant that it would take more time to bring about the necessary improvements, and more time meant that more people would die. No, if her campaign was to succeed, she needed to have something that enabled almost everyone to easily draw the same conclusion she had for herself: their nation’s sanitation methods were claiming more lives than their enemy’s artillery. She decided to model her data as a graphical illustration, specifically as a Rose chart (also known as a Polar Area or Coxcomb chart). Fig. 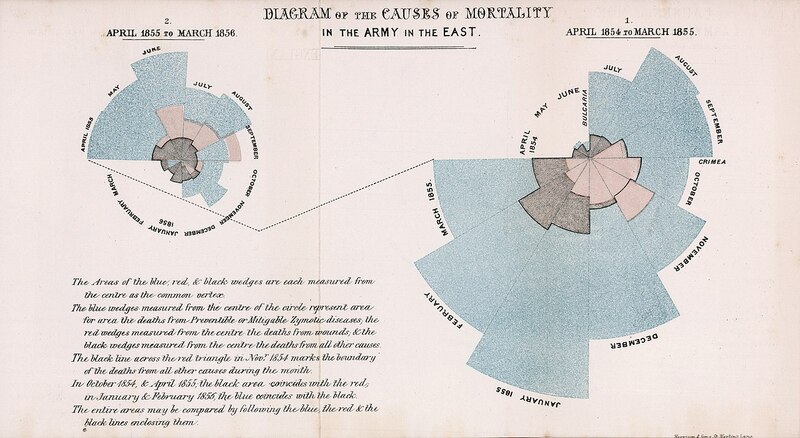 2 Nightingale’s 1858 Rose Chart that graphically illustrates mortality rates Text: The Area of the blue, red, & black wedges are each measured from the centre as the common vertex. The blue wedges measured from the centre of the circle represent area for area the deaths from Preventible or Mitigable Zymotic diseases; the red wedges measured from the centre the deaths from wounds; & the black wedges measured from the centre the deaths from all the other causes. The black line across the red triangle in Nov. 1854 marks the boundary of the deaths from all other causes during the month. In October 1854, & April 1855; the black area coincides with the red; in January & February 1856, the blue coincides with the black. The entire areas may be compared by following the blue, the red & the black lines enclosing them. At the time, these illustrations were quite an extraordinary feat, and very few statisticians had previously attempted to use these representations. This is because if the statistician was not careful with their calculations, then the representations could very easily mislead the observer. In fact, even FN was mislead at one point. Her initial analysis of the army’s mortality records led her to conclude that it was malnutrition, and not sanitation, that was the major cause of death during the Crimean campaign. As can be seen in this link here , a Rose chart consists of multiple wedges. These wedges are called sectors and each one represents a different category in one’s data. It is important to note that the individual value of each category is represented by the sector’s area and not the radius. This was actually what caused FN to misinterpreted her data at first, as she used the radius, instead of the area, to represent the value of each sector. Despite the fact that the calculations can make it tricky to accurately represent numerical data, the chart can, on-the-other-hand, simplify comparisons and enable observers to easily identify causation. Pearson, Egon Sharpe, Maurice George Kendall, and Robert Lewis Plackett, eds. Studies in the History of Statistics and Probability. Vol. 2. London: Griffin, 1970. Nightingale, Florence. Letter to Sir John McNeill. 1 March 1857. Letter H1/ST/NC3/SU74, copy ADD MSS 45768 f29 of Florence Nightingale: The Crimean War: Collected Works of Florence Nightingale, Vol.14. Ed. Lynn McDonald. Ontario, Canada: Wilfrid Laurier Univ. Press, 2010. 498-500. Print. Nightingale, F. (1859) A Contribution to the Sanitary History of the British Army during the Late War with Russia London: John W. Parker and Son. Nightingale, Florence. Notes on hospitals. Longman, Green, Longman, Roberts, and Green, 1863. Cohen, I.B. The Triumph of Numbers: How Counting Shaped Modern Life, W. H. Norton, 2006.
 ims25. “Mathematics of the Coxcombs” Understanding Uncertainty,11 May 2008. Web. 18 Dec. 2014. Small, Hugh (1998). Florence Nightingale: Avenging Angel. Constable, London. Heyde, Christopher C., and Eugene Seneta, eds. Statisticians of the Centuries. Springer, 2001. Farr, William. Letter to Florence Nightingale. (1857-1912). MS.8033, Nos. 1-20. Florence Nightingale and William Farr Collection. The Wellcome Library, Archives. London. Print. [Fig. 1] Wikicommons: Duyckinick, Evert A. Portrait Gallery of Eminent Men and Women in Europe and America. New York: Johnson, Wilson & Company, 1873. This entry was posted in Women in math and tagged Florence Nightingale, history, math, Mathematics on January 8, 2015 by u0614258. There’s far too little geometry—excluding topology and non-Euclidean stuff—on this blog, so let’s add a little. and orthocenter. Image: Rene Grothmann at the German Language Wikipedia. Our goal is to get to the Euler line, a line that passes through a triangle’s circumcenter, centroid, and orthocenter. The line is only determined for non-equilateral triangles; the points coincide in the equilateral case. We’ll look at the three points above. The circumcenter, centroid, and orthocenter are all “centers” of triangle. But what is a center of a triangle? Surely, it’s not a point equidistant to all points on the triangle. Our triangle would be a circle in that case. The circumcenter of a triangle ABC is the center O of the circle K that triangle ABC is inscribed in. Circumcenter O of triangle ABC. Image drawn by me. The circumcenter is actually the intersection of the three perpendicular bisectors of the triangle: FE, IG, and DH. To see this, first suppose that triangle ABC has a circumscribed circle K with center O. Draw radii AO, BO, and CO to each of the triangles vertices. This creates three smaller triangles AOB, BOC, and AOC. In each of these smaller triangles, drop an altitude from O. For example, in triangle AOB, altitude OD would be dropped. This splits AOB into two smaller triangles that are congruent by SAS, Line OD is perpendicular to AB by construction, and AD = DB. Hence OD is indeed a perpendicular bisector of side AB. Repeating this for other sides shows that the center of the circumscribed circle is the intersection of ABC‘s perpendicular bisectors. Moreover, the intersection of any to perpendicular bisectors is equidistant from each of the triangle’s vertices. The reader can see this by considering triangle AOC. Perpendicular bisector IG splits AOC into triangles that are congruent by SAS. It follows that lengths AO and OC are equal. Repeat for the other sides. We then see that the intersection of the perpendicular bisectors is equidistant from the triangle’s vertices. 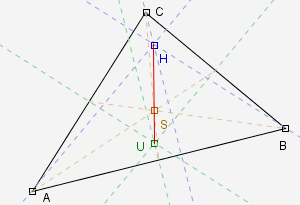 Thus the perpendicular bisectors of a triangle uniquely determine its circumcenter. The centroid is the intersection of a triangle’s three medians, lines drawn from a vertex that bisect the opposite side. As said in class, the centroid is the center of mass for a thin, triangular solid with uniformly distributed mass. Centroid O of triangle ABC. Drawn by me. The reader may suspect whether the three medians of a triangle intersect. Clearly two of the medians intersect; otherwise our triangle ABC would be a line. But the full proof is a little tedious. The proof involves assuming that two medians AF and CE intersect and drawing a parallelogram using the midpoints of the medians. We link to some proofs: http://jwilson.coe.uga.edu/EMAT6680Fa06/Chitsonga/MEDIAN/THE%20MEDIANS%20OF%20A%20TRIANGLE.htm uses classical geometry and http://math.stackexchange.com/questions/432143/prove-analytically-the-medians-of-a-triangle-intersect-in-a-trisection-point-of uses vectors. Four congruent triangles using midpoints. Image drawn by me. Interestingly, the midpoints of the sides of triangle ABC—the ends of the medians—cut the triangle into four congruent triangles. We will prove this in a roundabout way. Let E be the midpoint of AB. Draw a line EF parallel to AC where F intersects BC. Similarly draw FD parallel to AB. By construction, EFDA and EFCD are parallelograms. Then AD = EF = DC, so D is the midpoint of AC. Similarly, F is the midpoint of BC. The reader can see that the triangles are congruent by repeatedly applying SAS. Our final center is the orthocenter, the intersection of the three altitudes of a triangle. An altitude is a segment drawn from a vertex that is perpendicular to the opposite side. As with the two previous centers, the intersection of the altitudes at a single point isn’t immediately obvious. 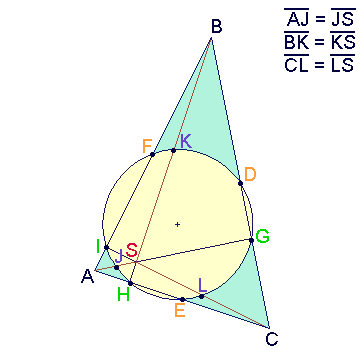 Orthocenter O of triangle ABC. Drawn by me. We show that the altitudes of triangle ABC intersect. Construct triangle DEF with triangle ABC inscribed in it by making sides DF, FE, and DE parallel respectively to BC, AB, and AC. Draw altitude BK where K intersects DF. Since AC is parallel to DE, BK is perpendicular to DE. Moreover, ADBC and BACE are parallelograms, so DB = AC = AE. Hence BK is a perpendicular bisector of DE. We repeat the argument for the other altitudes of triangle ABC. Then the altitudes of ABC intersect because the perpendicular bisectors of DEF intersect. There are a few other centers of a triangle that are either irrelevant to the Euler line or take too long to construct (i.e. I’m tired of drawing diagrams). The incenter is the center of the circle inscribed within a triangle. The incenter also turns out to be the center of a triangle’s angle bisectors. The Euler line doesn’t pass through the incenter. The nine-point circle is the circle that passes through the feet of the altitudes (the end that isn’t the vertex) of a triangle. Nine-point circle of ABC. Image: Maksim, via Wikimedia Commons. Strangely, the circle also passes through the midpoints of the sides of its triangle. But that’s not all. The circle passes through the Euler points, the midpoints of the segments joining the triangle’s vertices to the triangle’s orthocenter. Thus the nine-point circle does indeed pass through nine special points of a triangle. The center of the nine-point circle lies on the Euler line. After all this, we still haven’t proved that the circumcenter, centroid, and orthocenter lie on the same line. We won’t prove this. Here’s a video of the proof by Salman Khan: https://www.youtube.com/watch?v=t_EgAi574sM. The proof uses a few facts about the centers we haven’t discussed, but these facts aren’t too hard to show. Refer back to my four congruent triangles picture. Let O, K, and L respectively be the circumcenter, centroid, and orthocenter of triangle ABC. Then Khan proves that triangle DOK is similar to triangle BLK. This implies angles DKO and CKL are equal, which means O, K, and L lie on the same line. This entry was posted in European mathematics, Geometry and tagged angle bisector, center, centroid, circles, circumcenter, circumscribe, Euclidean Geometry, Euler, Euler line, geometry, incenter, inscribe, math, Mathematics, median, nine-point circle, orthocenter, perpendicular bisector, triangle on December 18, 2014 by abstractreasoning. The history of mathematics has been fraught with disappointments for mathematicians. This is particularly true in regard to the expected and continued failure of numbers, and math in general, to be pure and graceful. The Pythagoreans, in 6th century BCE Greece, venerated the whole numbers with an almost religious devotion because of their purity, and believed that the universe could be described by using only whole numbers. Unfortunately, math is not as pure as the Pythagoreans thought, which was revealed first by Hippasus of Metapontum when he discovered an undeniable proof for the existence of irrational numbers. Incidentally, Pythagoras had poor Hippasus drowned because of this. (The tale of the drowning of Hippasus may be merely a legend, like much of what is “known” about the Pythagoreans, due to a lack of reliable sources from the period.) Another impurity of numbers was wrestled with for millennia in the form of the square roots of negative numbers, a problem that was only put to rest with the advent of the imaginary number i. However, numbers turned out to be even weirder than previously imagined, because transcendental numbers were discovered by Gottfried Wilhelm Leibniz, in 1682. In order to understand transcendental numbers, we need to understand algebraic numbers, or numbers that are not transcendental. An algebraic number is any number that is the solution to a polynomial with rational coefficients. Rational numbers are numbers that can be written as the ratio of two integers. All rational numbers are algebraic numbers, for instance the number 2 is a rational number because it can be written as 2/1. It is also an algebraic number because it is the root of the polynomial X – 2 = 0, which is a polynomial with only rational coefficients. While all rational numbers are algebraic, not all are algebraic numbers are rational, for example, √ (2) is an irrational number, but it is also algebraic because it is the solution to X² – 2 = 0. Strangely, the imaginary number i, although it is not real, is an algebraic number since it is the root of the polynomial X² + 1 = 0. Transcendental numbers are numbers that cannot be written as the root to a polynomial with rational coefficients. All transcendental numbers are irrational. Leibniz coined the term “transcendental” in his 1682 paper in which he proved that the sin function is not an algebraic function. Leonhard Euler (1707- 1783) was the first to generally define transcendental numbers in the modern sense, although it was Joseph Liouville, in 1844, who definitively proved the existence of the first transcendental number. That number is now called the Liouville Constant, and it is .110001000… with a 1 in every n! place after the decimal. The Liouville Constant was specifically constructed by Liouville to be a transcendental number. However, Charles Hermite first identified a transcendental number that was not created for that purpose in 1873. That number was the constant e, or Euler’s number, and is the base of the natural logarithm. A famous transcendental number, called “Champernowne’s Number,” was discovered in 1933 and named after David G. Champernowne. It is formed by concatenating all the natural numbers behind the decimal point 0.12345678910…. Although, easily the most famous transcendental number is pi, which was proved to be transcendental by Ferdinand von Lindemann in 1882. Pi. Image: Travis Morgan, via Flickr. Georg Cantor, in the1870’s, proved that there are as many transcendental numbers as real numbers, a concept that is mind-boggling since the real numbers are uncountable. However, only a few numbers have ever been definitively proven to be transcendental, because it is extremely difficult to prove that any given number is transcendental. Along with irrational and imaginary numbers, transcendental numbers have challenged and frustrated mathematicians throughout the ages. Undoubtedly, Pythagoras would be horrified by transcendental numbers, or maybe he would just drown anyone who tried to tell him about them. Today, however, transcendental numbers are embraced by mathematicians as a deep and important part of math. This entry was posted in European mathematics, Greek mathematics and tagged Champernowne’s Number, Charles Hermite, e, Euler, Georg Cantor, Gottfried Leibniz, Liouville Constant, math, pi, transcendental numbers on December 11, 2014 by arithmomancy. Alan Turing. This image is in the public domain in the US because its copyright has expired. What’s the first thing you think of when you hear the name Gottfried Leibniz? Let me guess: calculus. Now what do you think when you hear of Alan Turing? You might think of codebreaking during World War II, or the new movie coming out about him (The Imitation Game), or maybe you haven’t heard of him. So why would I mention these two together? Computers of course! Wait, what do these two have to do with computers? Well let’s take a look and see. By 1928, Hilbert had broadened his question about Diophantine equations to a much more general question about mathematical statements in general: is there an algorithm that is universally valid. This created a new idea; is there an algorithm that can tell us if any algorithm will terminate? The last of these three ideas was the beginning of the Entscheidungsproblem. In May, 1936 Alan Turing wrote a paper called “On Computable Numbers, with an Application to Entscheidungsproblem.” In this paper, Turning reformatted Kurt Godels results on the limits of proof and computation. He made a hypothetical device known as the Turing machine and went on to prove there was no solution to the Entscheidungsproblem. He did this by using his Turing machine to show that the halting problem is undecidable; that it is impossible to know whether a program will finish running or continue forever. The Turing machine itself can represent a computing machine. It can change symbols on a strip of tape based on a set of tools. A Turing machine has 3 main components, the first being an infinite tape. This infinite tape would be divided into cells in which a symbol can be placed. In the tape there would be a head. The head accesses one cell at a time, while moving either right to left or left to right. The third component would be a member were there would be a fixed finite number of states. After having these three components you have three actions: 1) write a symbol, 2) move either left or right, and 3) update its current state. The formal definition of a Turing machine is defined as a 7-tuple. The seven elements of the tuple would be as follows: a set of states, an input alphabet, the tape alphabet, the start state, a unique accept state, a unique reject state, and a transition function. 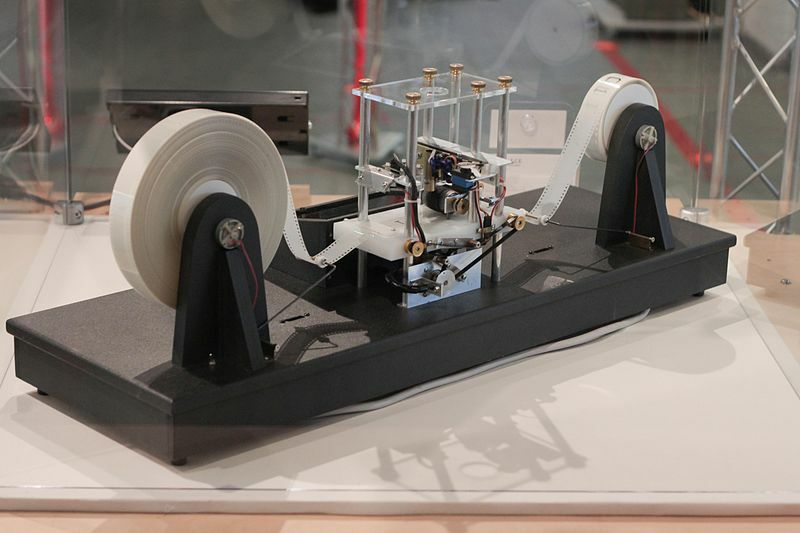 A Turing Machine, without infinite tape. Image: Rocky Acosta, via Wikimedia Commons. Turing’s work on the Entscheidungsproblem and the Turing machine can be thought of as the birth of computer science and digital computers. During World War II the idea of the Turing machine was used and manipulated into a simpler form, as well as into an actual electronic computer. This led to machines such as the counter machine, register machine, and random access machine. All of these machines launched us even further into the computer era. It is interesting to see that the birth of the modern computer came from the Entscheidungsproblem, an idea that Leibniz had first thought of. Why would I think this is interesting? Leibniz had also worked on binary numbers and arithmetic, which is similar to what is used today in modern computing. It seems that Leibniz was ahead of his time. Alan Turing seems to have just taken his ideas and brought them to our times. We can see that without Turing we wouldn’t have modern computers the way they are. This means we wouldn’t be able to do any math that requires a computer to help with computations. Think, how many times have you used your computer to access the Internet to get the answer to a math problem you were unable to solve? Not only that, but studying math wouldn’t have been as easy. Knowledge that is passed through the Internet wouldn’t be possible without computers, with no YouTube to help show how to solve math problems, with no Khan Academy or Wolframalpha, and no easy access to any knowledge of any past essays that were written. Sadly, Turing’s end wasn’t a happy one. Living in England in the early 20th century as a gay man led him to commit suicide. Leibniz lived almost twice as long as Turing. It makes you wonder if we could have had even more interesting computing machines or ways of thinking of computational mathematics if he had lived a full life past the age of 41. This entry was posted in Big Problems, European mathematics and tagged Alan Turing, algorithm, algorithms, computers, computing, computing machine, Diophatine equation, Entscheidungsproblem, Gottfried Leibniz, hilbert, logician, math, Mathematics, The Imitation Game, Turing Machine on November 26, 2014 by turing12. 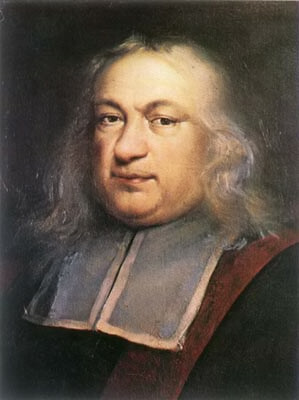 In mathematics, a Fermat number, named after Pierre de Fermat who first studied them, is a positive integer of the form. Fn=22n+1, where n is a nonnegative integer. The first few Fermat numbers are: 3, 5, 17, 257, 65537, 4294967297, 18446744073709551617. And he is the first to investigate numbers of the form 22n. Mersenne numbers, which take the form of 2n-1, were named after Marin Mersenne, a French monk from the early 17 century, who corresponded with Fermat. We are particularly interested in the case when Mersenne number are prime. It is not doubt that the first 17 primes of the form 2n-1 match the following n values: 2, 3, 5, 7, 13, 17, 19, 31, 61, 89, 107, 127, 521, 607, 1279, 2203, 2281 (Zegarelli 287). The first 12 Mersenne primes were known since 1914 and the 12th, 2127-1, was established by Anatole Lucas in 1876. It was one of the largest-known prime number for over 75 years. The next 5 Mersenne primes (p=13 to 17)were discovered in 1952. It was in 1952 when the testing program for Mersenne numbers was began. This led to the establishment of three other primes. More testing has been carried out using modern day computers and the smallest Mersenne number that is untested is 22309-1 (~2013), and this has not been a case of great interest. There is a conjecture that 2n-1 is always prime when n is a Mersenne number. And the more interesting case is the 28191-1 because the 8191 also is the Mersenne number. (Křížek, Florian and Lawrence 214). Chris K. Caldwell (2014). Pepin’s test . [ONLINE] Available at: http://primes.utm.edu/glossary/page.php?sort=PepinsTest. Crandall, Richard E, and Carl Pomerance. Prime Numbers: A Computational Perspective. New York: Springer, 2005. Internet resource. Zegarelli, Mark. Basic Math & Pre-Algebra Workbook for Dummies. Hoboken, N.J: Wiley, 2008. Internet resource. Křížek, Michal, Florian Luca, and Lawrence Somer. 17 Lectures on Fermat Numbers: From Number Theory to Geometry. New York, NY [u.a. : Springer, 2001. Print. This entry was posted in European mathematics and tagged algebra, Fermat, math, Mersenne, prime, prime number on November 1, 2014 by shaoyuspace.